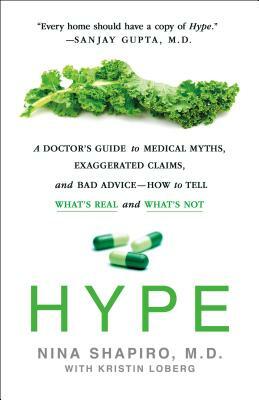 Hype covers everything from exercise to supplements, diets to detoxes, alternative medicine to vaccines, and medical testing to media coverage. Shapiro tackles popular misconceptions such as toxic sugar and the importance of drinking eight glasses of water a day. She provides simple solutions anyone can implement, such as worrying less about buying products labeled organic or natural, and more about skipping vaccines, buying into weight-loss fads, and thinking you can treat cancer through diet alone. This book is as much for single individuals in the prime of their lives as it is for parents with young children and the elderly. *Are online doctor ratings valuable and what conditions can you diagnose online? *What’s the link between snoring and ADHD? *What does “Doctor Recommended” and “Clinically Proven” mean? *Which vitamins can increase your risk for cancer? *Do vaccines introduce toxins into the body? *What’s the best antiaging trick of the day that’s not hype? *Can logging “ten thousand steps a day” really have an impact on your health? Never has there been a greater need for this reassuring and scientifically backed reality check. Dr. Nina Shapiro is the award-winning Director of Pediatric Otolaryngology and a Professor of Head and Neck Surgery at UCLA. She is featured in The New York Times, Time, The Wall Street Journal, NPR, and CNN.com among others. She is a regular on CBS’s The Doctors. Kristin Loberg is the #1 New York Times, Wall Street Journal, and USA Today bestselling co-author of Grain Brain, A Short Look at a Long Life and others. She attended Cornell University and lives in L.A. with her husband and two sons.